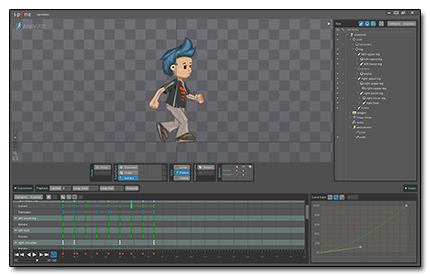 Spine is a 2D skeletal animation tool for game development and other animation projects. It features an intuitive workflow to rig and animate skeletons, a multiple-timeline dopesheet for retiming and tweaking animations, and powerful exporting capabilities. Reduced art assets: characters can be animated in many ways without requiring additional art. Small data size: animations are tiny, enabling hundreds of animations to be used throughout a game to bring it to life. Faster development: creating and making use of animations is easy, even programmers can do it. Animation reuse: all the same animations can be reused for characters that look completely different if they use the same skeleton. Procedural manipulation: modify the skeleton or animations at runtime to react to game situations. Smooth interpolation: interpolated keyframes mean animation is as smooth as the framerate. Animation blending: transition smoothly to a new animation by blending it with the old animation.